After spotting my post about Half Acre Beer Company in Merge, the fledgling brewery contacted me to offer a taste so I could judge for myself how well they make their product. I accepted, and a few days later their point man, Gabriel Magliaro, stopped in the office with six-pack in hand and ready to chat. 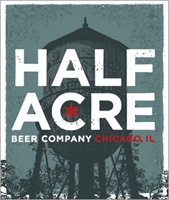 Half Acre has been under development for about a year and a half, Magliaro said, and just started selling last week. The company is based on the West Side, but the beer itself is brewed by a contract brewer in Black River Falls, Wisconsin, a common strategy for small, start-up beer brands. Half Acre hopes to one day brew beer themselves here in the city. Their first beer, a lager, is available primarily in Wicker Park and Bucktown; you can find it at the Charlston, Pint, Jerry's 2 and Bacino's, and in six-packs at the 7-11 on Damen and the Always Open on Milwaukee. They hope to expand to the rest of the city and beyond very soon (it's in the hands of their distributors). So, what does it taste like? For a lager, it's surprisingly complex, far from the flimsy, watery Budweiser, the number-one selling lager in America. The beer has a dark amber color with a little cloudiness, and a somewhat bitter-tart aroma. I tasted a big orange-blossom note floating on top of a rich caramel flavor that provided depth to stand up to food, but not so much that it can't be drunk on its own. Very effervescent, with a nice balance of yeasty tartness and hoppy bitterness. This is definitely a beer worth seeking out.